How to Add Command Prompt Here Shortcut to Windows Context menu? If you frequently use command prompt in windows to do work, it is a pain to navigate around and to change to a specific directory. If you can add the Open Command Prompt option to your shortcut menu it would be easier you to open the command prompt window from any folder. If you can add Command Prompt to your shortcut menu, whenever you do a right click on any folder an choose the Command Prompt. This option opens a Command Prompt window with that folder as your active directory. It is very easy to add Command Prompt option to the context menu of the windows explorer. see the steps below. Go to Tools Menu and then to Folder options. Click Advanced button. This will open Edit File Type dialog box. Press OK on all windows. “Open Command Window Here” Microsoft Powertoy is another useful tool to add Command Prompt Shortcut to context menu.This Microsoft PowerToy adds an “Open Command Window Here” context menu option on file system folders. 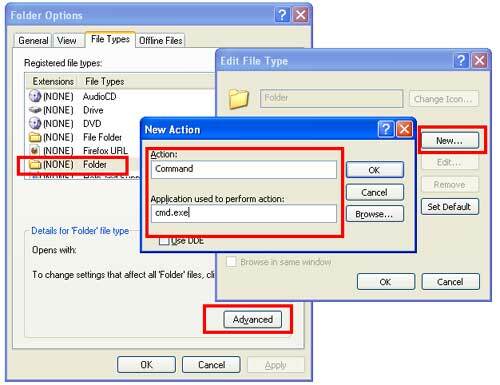 This allows the user a quick way to open a command window pointing at the selected active folder. Download Open Command Window PowerToy Here. How to Resize Digital Pictures Quickly and Resize Multiple Photos at Once ?